Windlestraw Lodge, the perfect destination for a romantic break offering you deluxe bed & breakfast with a fine dining restaurant. 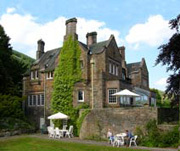 Escape to the beautiful Scottish Border countryside with outstanding views of Traquair & Elibank forests and over the majestic River Tweed and Tweed Valley.Now the home of Chef Alan Reid and his wife Julie, who together have combined experience of more than 30 years in the catering and hospitality business. They look forward to welcoming you to this tranquil oasis which offers superb food, six luxury en-suite bedrooms, beautiful gardens amidst breathtaking scenery, yet within easy reach of all the major Border towns such as Peebles, Kelso, Melrose and Galashiels. Windlestraw Lodge has six luxury bedrooms with beautiful interiors and ensuite bathrooms. Peddie, Ballantyne, McIntosh and Willison are all south facing. Moritz is west facing and Caberston is north facing. The Windlestraw restaurant offers the finest dining experience in the Tweed Valley. Menus can be tailored to your choice and children under 10 can have high tea between 5.00 - 6.00pm.